Learn about the temperament and personality of the Golden Retriever. Discover what he's like to live with, his traits and characteristics and how he generally behaves. And look at lots of Golden Retriever photos. The Golden Retriever is a happy-go-lucky clown. He's reliable, trustworthy, calm, friendly, gentle and confident. He's very eager to please you. He isn't a one-man dog because he loves everybody. He's friendly with all dogs and strangers. He's highly intelligent and trainable. He's very active and energetic. He loves to romp, run and play outdoors and he loves to swim. He's gentle and patient with kids, even bratty ones! He loves to play games and have fun. He's athletic, agile and fast on his feet. 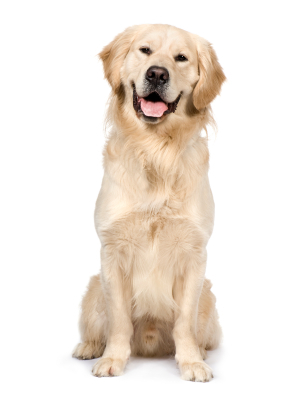 The Golden Retriever is the most intelligent and easiest to train of all dog breeds! He learns new commands quicker than any other breed, which makes him very easy to train. The Golden Retriever is a very heavy shedder. He sheds an awful lot of hair! You'll find hair all over your home, stuck to everything! You'll probably even find it in the butter!